Matted fur on cats can be caused by many things, from mud to tar. These mats are unattractive, but they can also be dangerous and lead to skin lesions and skin infections. 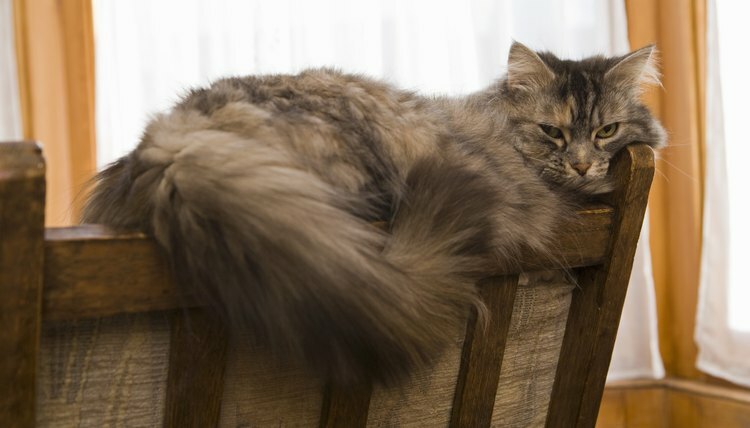 When a cat has a matted clump of fur, oxygen is unable to reach the skin, which is can lead to a buildup of bacteria. These mats can also hold in dirt and debris, which can also lead to infection. Removing these mats is possible at home. Lie your cat down, making sure you have access to the matted area. Place a small amount of corn starch on the area and work it into the matted fur. Pull the mat up with your fingers or a fine-toothed comb, making sure not to pull on the cat’s skin. Work at the matted area with a seam ripper by moving it from side to side over the mat to remove any debris or sticky material. Comb the hair apart once the mat has been loosened with the seam ripper. Wash out any debris left on the fur or skin with warm water. Cut out stubborn mats with a small pair of scissors. Make sure to use a pair of clean, sterile scissors that have been cleaned with rubbing alcohol. Ask someone else to help you hold the cat down if he is fighting this process. If you do accidentally cut the cat with scissors, rub the area with some antibiotic ointment and wrap it with medical gauze.